Some jobs are sprints, others are marathons. There are lots of roles, such as those in retail, hospitality and logistics, where you are likely to be bouncing between quiet, calm periods and busy, highly demanding periods several times in the same day. Others, such as marketing, copywriting and many office-based roles, are slow burning but taxing all the same. Spending all day sitting at a desk doesn’t sound awfully tiring, but mental exhaustion is just as exacting as physical exertion. Here are some simple but valuable tips for staying as energetic as possible throughout your day. Snacking is often the bane of anybody who wants to keep in shape, yet spends their 9-to-5 sat at a desk. Despite the abundance of unhealthy snacks in the 21st century, this doesn’t have to result in a diet loaded with additives. In fact, nutritionists have stated that this is not detrimental to your health when done right, and is just as good for your body as a solid three meals a day. Smaller boosts of energy spread out amongst your working hours can be just what you need to prevent your concentration from flagging -- just be sure it isn’t all sugar! This is not to suggest you should start dictating your own work schedule over your manager, but there’s no harm in letting your mind and body take a quick breather from the screen and having to hold that horribly stiff computer desk pose. There’s nothing tricky in this; simply walk away from your desk. Get yourself a tea or coffee, nip to the toilet, go and restock on pens from the stationary cupboard. Anything that allows you to defocus and stretch your legs for a few minutes is ideal. Deliberately loitering is, of course, not going to go down well, but a small and meaningful reason to disengage from your keyboard could be all you need to recharge for the next couple of hours. A cluttered work space is a cliché for creative types, and in my experience it’s true more often than not. Trying to cope with a disorderly desk, however, is preventing you from numerous benefits. When your physical working area is clear and organised, your work life can see fantastic improvements such as greater focus, more freedom to be adaptive and a good reputation with your managers. 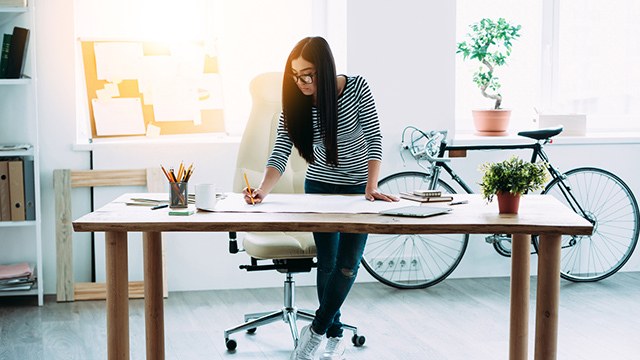 Demonstrating your ability to keep things organized and tidy is a great indicator that you’re serious about your work and you’ll keep things in check, which can always lead to better opportunities down the road. Having small checkpoints for your work can make it much easier to get through a long list, particularly when used to break a big task or project down to simpler, bite-sized tasks. In project managing roles, this is referred to as a work breakdown structure (WBS), and it is commonly employed to help keep everyone involved on-track and focused on their individual goals. When combined with small rewards for yourself (such as that coffee break or a harmless bit of chocolate), you can make the work day far less daunting and almost turn it into a game of sorts. There are lots of ways you can make the work day flow easier, and the things that will work best depend on the kind of person you are. Maybe music keeps you focused, or perhaps any noise whatsoever is the concentration killer. Be open and communicative with your management, and see what they can help you incorporate -- after all, they want you to work at your best, and you should too!